Results of McCarthy’s research on the unique, early American experimental silver coin, which once was in the hands of one of America’s Founding Fathers, Alexander Hamilton, are in the August 2017 edition of The Numismatist, the official journal of the American Numismatic Association (ANA; www.money.org). Now insured for $5 million, the historic ancestor of the dollar as well as of every other coin in the western world using a decimal monetary system was on display at the Kagin’s booth during the ANA 2017 World’s Fair of Money in Denver, Colorado, August 1–5. “Although the coin was discovered in 1870, it was misattributed. 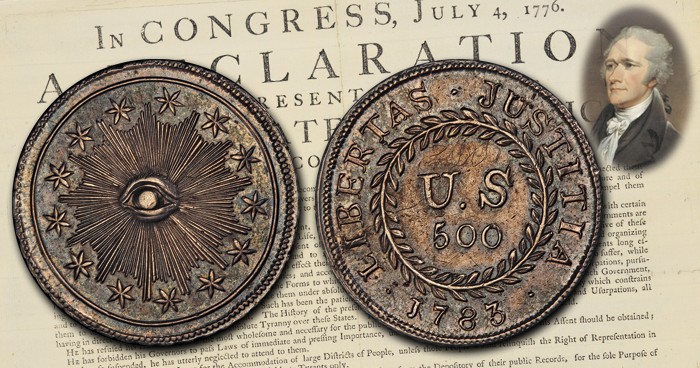 We now have compelling evidence that it is ‘the first that has been struck as an American coin,’ as described in the April 2, 1783, diary entry of Robert Morris, a signer of the Declaration of Independence and the U.S. government’s first superintendent of finance,” said McCarthy. “The quint and a subsequent set of coins were created in Philadelphia in April of 1783 under authority of the Treasury some nine years before the next coins would be struck by the U.S. government. It would have been valued at 500 units in a proposed system that would range from 5 to 1,000 units,” McCarthy said. During the 1770s and 1780s, several states and private individuals manufactured coins, but this was the first coin that was struck and paid for by the U.S. government, according to McCarthy’s research. A dozen other early American coin experts agreed with his findings before he submitted them for publication. After examining McCarthy’s research, early American coin researcher and writer (as well as the ANA’s 2007 Numismatist of the Year) John Dannreuther, of Memphis, Tennessee, summed up the findings as follows. “There are numerous things that bring us to this conclusion, the first being that ‘Nova Constellatio’ is not found on the Plain Legend quint. One does not remove legends, they are added,” explained Dannreuther. “Thirdly, the two quint dies obviously were engraved by two different hands. Since we know that the die with Legend coins match the other denominations in style, as well as having the ‘Nova Constellatio’ legend, the Plain Obverse has to be the first one—thus, it is the first United States coin,” stated Dannreuther. 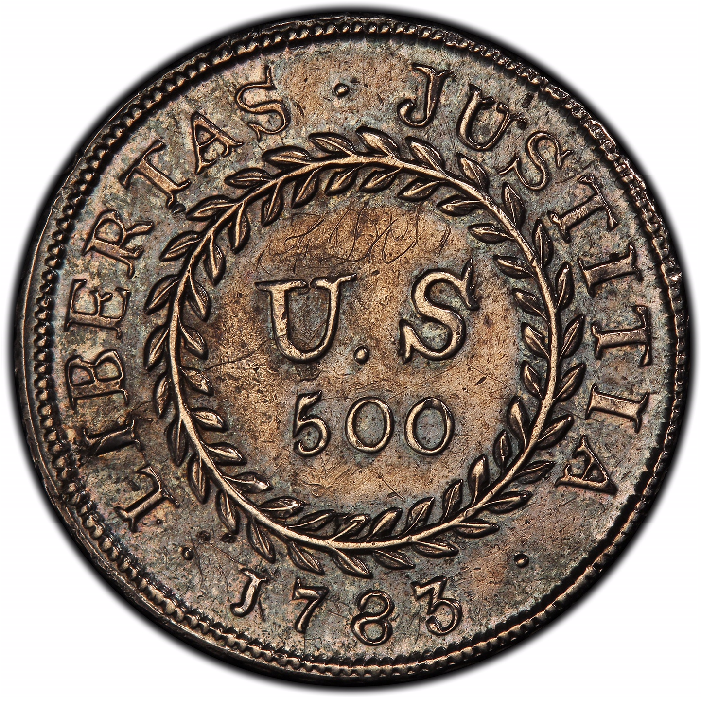 Only two examples of the 500-unit coin are known, and each is distinctively different on the obverse. One has the words NOVA CONSTELLATIO, Latin for “a new constellation,” while the other example does not have any words. The research demonstrates the coin without the words on the obverse was struck first. After surfacing in New York City nearly 150 years ago, the coin was carefully preserved in several major collections, including those of Lorin G. Parmelee, S.H. and H. Chapman, and Wayte Raymond, before becoming part of the Garrett Collection and into the possession of Johns Hopkins University, where it resided for much of the 20th century. Only more recently has numismatic research brought together evidence that it was the first federal coin made by authority of the U.S. government. 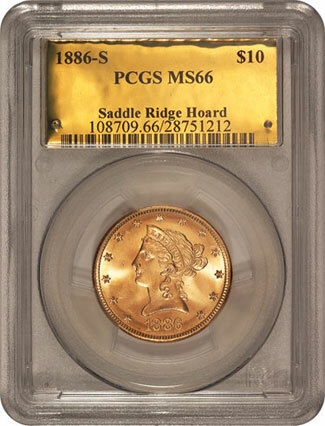 Kagin’s acquired the coin at a 2013 auction, where it was graded PCGS AU-53 Secure. McCarthy began researching it through the writings of Morris and Thomas Jefferson, Continental Congress documents, and forensic evidence found on the coins themselves. In addition, he consulted with other noted experts in early American numismatics. “While the 1783 Plain Obverse Nova Constellatio quint is among the most historically significant of all United States coins, it is also one of the most important artifacts in the world,” stated Kagin. “Nothing defines a nation and its society more than its coinage. Just like great documents such as the Magna Carta or the Declaration of Independence established fundamental principles and tenets for western society, so does coinage reflect a nation’s most important ideals, becoming a primary source of communication for a nation’s beliefs. Kagin said the coin’s inscriptions and symbols contain the most important aspects of our fledgling nation. 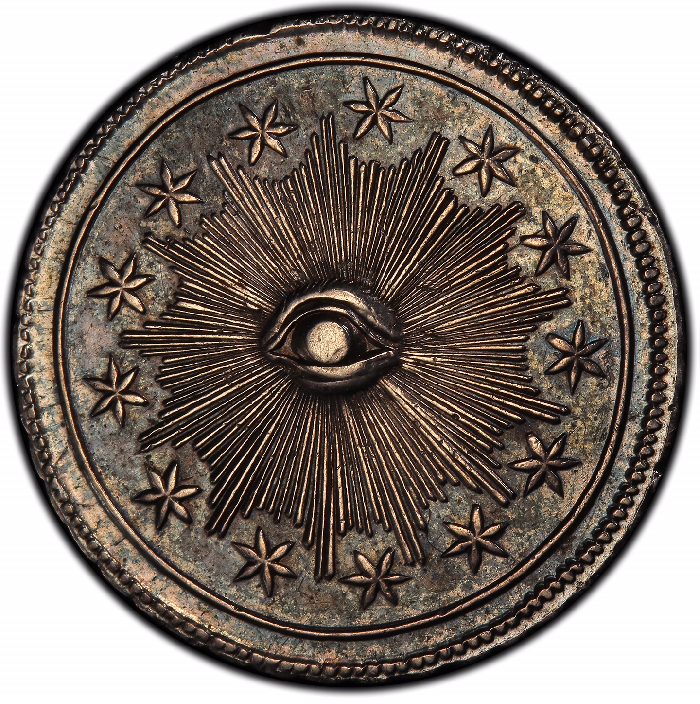 On the obverse the central devices are the Eye of Providence, symbolizing the Creator’s approval of our nation, and a circle of 13 stars—a theme that has endured for 240 years—as an obvious reference to the new constellation formed by the original 13 colonies. At the center of the reverse, within a simple wreath of laurel, the inscription U.S proclaims the name of the new country for the entire world to acknowledge. The denomination—in this case, 500 (units), or a quint—is below. Two of the most fundamental and defining issues for Americans then and today are prominently inscribed around the circumference of the wreath, in Latin so all nations could understand: LIBERTAS (Liberty) and JUSTITIA (Justice). The date, 1783, is at the bottom of the coin. “This coin, struck in the precious metal silver, was also the very first artifact to present our nation’s new decimal system. In fact, the first use of such a vital and enduring system to be established in the western world,” concluded Kagin.